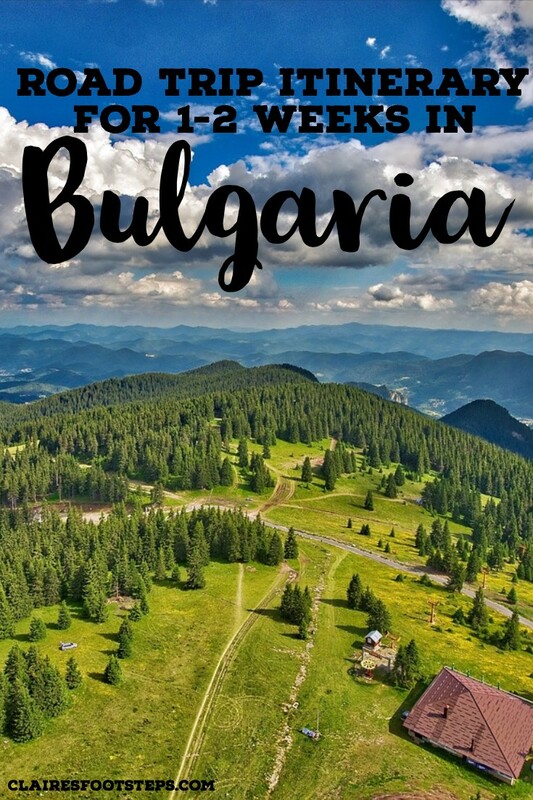 In the middle of the Balkans Mountains and the Black Sea lies Bulgaria, a country so rich in history and natural wonders that will take your breath away. Perfect for those that dislike mainstream tourist destinations, Bulgaria is in fact often overlooked by its popular southern neighbour, Greece. 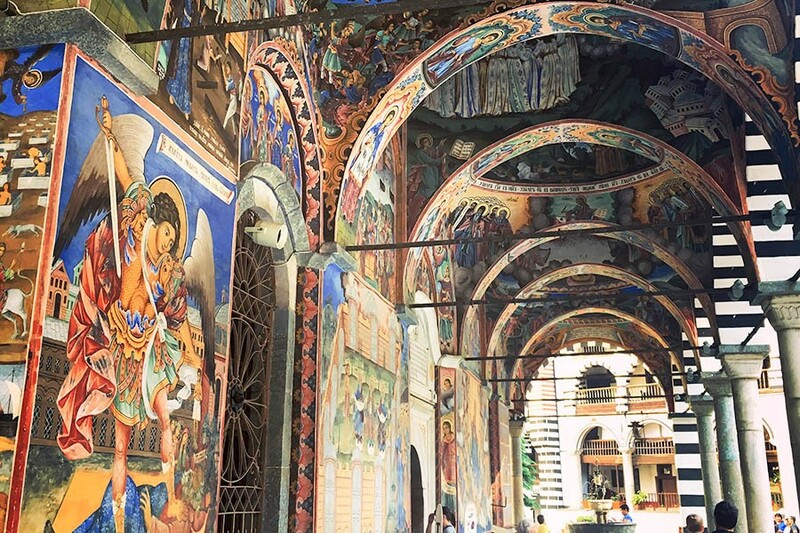 This Bulgaria road trip itinerary will show you the best of this relatively unexplored country, from the north, south, east and west. On the road, you will pass through miles and miles of sunflower fields and beautiful mountains. You will see countless little villages with off-white houses, with red tiles on rooftops and vegetable gardens covered with vines. In the heartlands, you will sometimes stumble upon old communist statues near villages or even see previous Bulgarian and Soviet leaders painted on buildings. A road trip in Bulgaria is a truly unique experience. While Bulgaria has a reputation of having bad roads, we found that some were bumpy but in general, the main roads are well maintained, so driving was not too difficult. Before detailing the Bulgaria itinerary, my first Bulgaria travel tip will be: get a GPS that works! The one that we rented with the car was inaccurate a lot of the time and we often got lost in the smallest villages and drove a lot on dirt roads. Also, beware that the country does not have a lot of highways which can make your trip longer. Our first stop on this Bulgaria travel itinerary is its capital, Sofia. 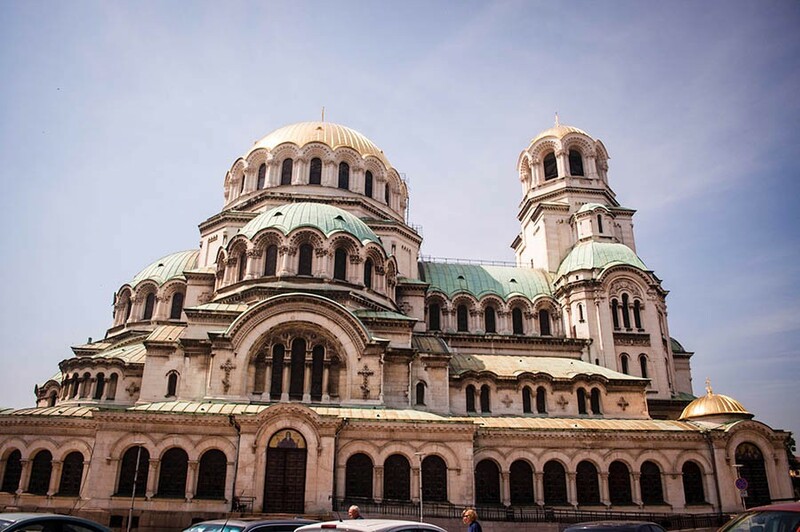 There is plenty to explore in Sofia in 2 days or more; the city has an eclectic style of architecture from different periods like Byzantine, socialist and ancient Greek. This wide array of architectural styles are downtown and can be easily explored by foot, all you need to do is follow the yellow bricks around Serdika square. The central part of the city was built around Alexander Nevsky Cathedral. The Orthodox Church is the symbol of the city and one of the most photographed spots in Bulgaria. The domes are very beautiful and they give a nice colour touch to the city. Sofia is often called the Jerusalem of the East, as it gathers the three monotheist temples very close to each other. Did you know that the Sofia Synagogue is the biggest in Eastern Europe? Full of shops, terraces, restaurants, bars and coffee shops, Vitosha Street is the heart of the capital. Stroll around this pedestrian street and enjoy the vibe and the mountains as a backdrop. The city is easily walkable and the public transit works perfectly. Plus, if you are a museum lover, this will be the perfect city for you! Sofia has numerous parks and green areas, like Borisova. Think about it as the Central Park of Sofia. This is a perfect occasion to rest and to cool off the from summer heat, if you are visiting during the hot months. The metropolis is also known for its numerous public markets. The Central Hall, Zhenski and Ladies’ market provide different things to see, smell, taste and buy. When you’re wondering where to eat in Sofia, here is a great spot; you will not have fresher food than this! Also, remember to check the Bitaka flea market for some unusual findings. For an extra thing to do in Sofia, take some time to go to the Vitosha Mountains and enjoy the hikes there. If you are visiting during the winter, you can ski there as well! The mountains are only 30min away from the city centre by car. Budget: Crosspoint Sofia Hostel is a chilled out, small hostel that’s perfect to spend a few days in on a budget. Click here for rates and book today. Mid-Range: Calipso Hotel is great value, with comfy beds, awesome warm showers and modern features. The hotel is very clean and has a bar and restaurant on site. Click here for rates and to book. Luxury: Hotel Anel has spacious rooms, free WiFi, an on site restuarant serving delicious food and a luxurious spa centre. Here, you can start your day with a tea or coffee from the coffee machine and an included breakfast, and finish it with a work out at the gym and a dip in the pool! Click here for rates and book today. The region next to Sofia with its mountainous roads are the most beautiful we saw during our trip. 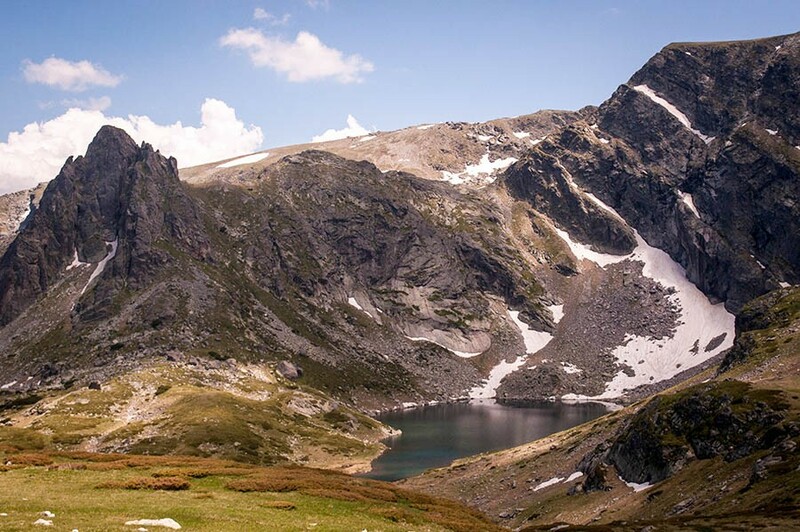 Your first stop outside the capital should be the Seven Rila Lakes. The pristine lakes with eternal snow and mountain air are breathtaking. Next up is the Rila monastery. This UNESCO World Heritage Site is the number one tourist attraction in the country due to its beautiful frescoes. Melnik is a cute little town to spend a couple of hours. It is very picturesque with its traditional architecture listed as a historical heritage. In the backdrop, there is a peculiar rock formation in the shape of pyramids tha look almost out of this world. The Melnik region is widely known for its wines. There are vines that are specific to the region, which makes the wine very different from the other varieties. Budget: Guest House Biser is located in the city centre and offers private, air-conditioned units with en-suite bathrooms. Click here for rates and to book. Mid-Range: Guest House Holiday in Melnik is in a great location, with clean, well-facilitated rooms with fresh linen and toiletries. Click here for rates and to book. Luxury: If you really want to treat yourself, Zornitza Family Estate Relais & Chateaux has a heated outdoor pool and glorious views of the surrounding nature. It is in a gorgeous location and offers villa or studio style accommodation. Check rates and book today. 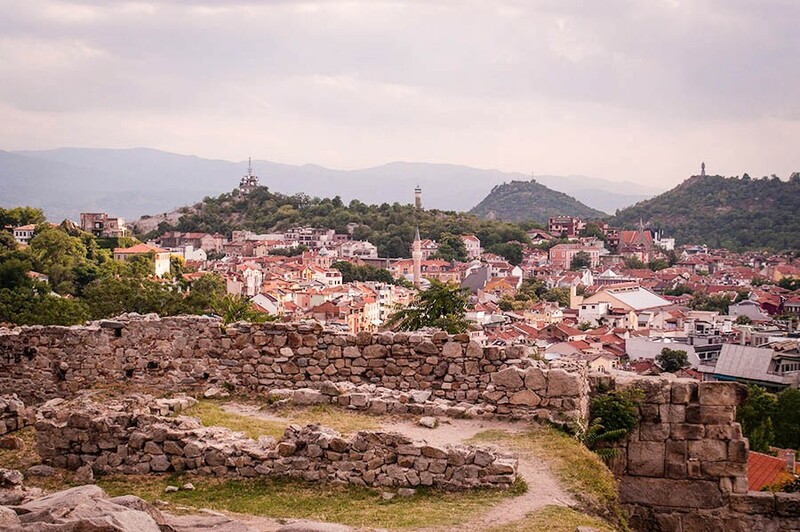 Plovdiv is Bulgaria’s cool and laid-back city. Kapana or “The Trap” is by far the hippest neighbourhood in the country; and one of the best places to visit in Bulgaria. It has a very young and hip vibe with its wine bars, craft beers, coffee shops and artsy stores. 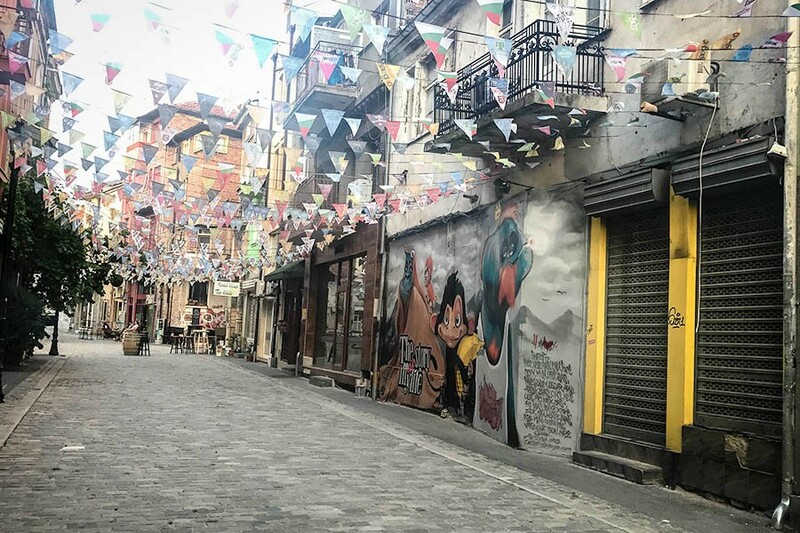 Decorated with streamers and graffiti, Plovdiv will surely seduce you. The neighbourhood inherits its name due to its labyrinth-like streets, all intertwined with each other. Another must-see part of the city is the Old Town, with its picturesque cobblestone streets, colourful houses and small buildings with wooden shutters from the 19th century. At the end of the Old Town, you will find a beautiful Roman ancient ruin theatre, Philippopolis. Overlooking the mountain, this relic still functions as an open-air theatre/music hall with great acoustics. 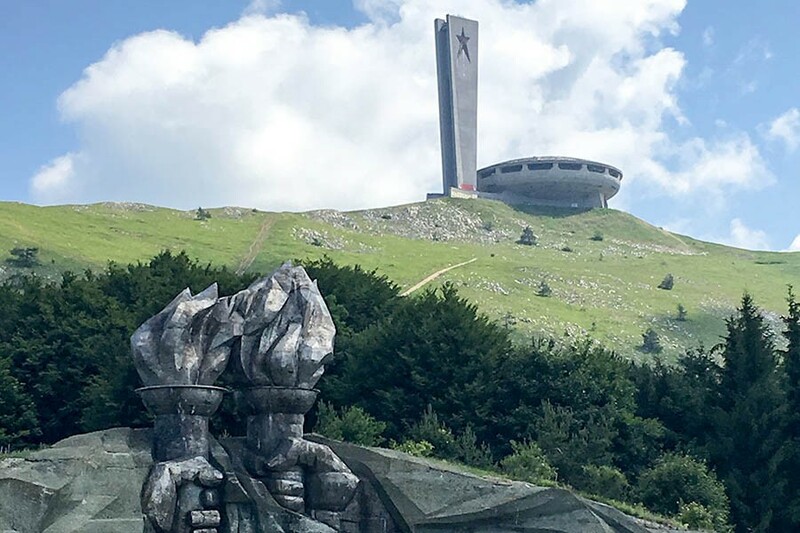 The region surrounding the city has miles and miles of vineyards, beautiful mountains and even an abandoned communist monument shaped like a UFO. There are also some great places to eat and drink in Plovdiv – this guide to Plovdiv will detail all of this and more! If you are a wine lover, then you should spend some time driving along the wine route. The route is easy to follow and the vineyards are just 30 min to 1 hour distance from the city, perfect for a day trip. Bulgaria Road Trip Tip: you have to reserve if you wish to do tours and tastings. Also, most of the vineyards are closed on Mondays. Lost in the middle of Bulgaria, in the centre of the Balkans Mountains, lays an abandoned gigantic concrete UFO-shaped like monument. Buzludzha was once the meeting point of the communist regime of the country in the 80’s. The imposing brutalist architecture is now left to abandon with extreme decay on both the interior and the exterior of the building as well as on the mountain road leading to it. 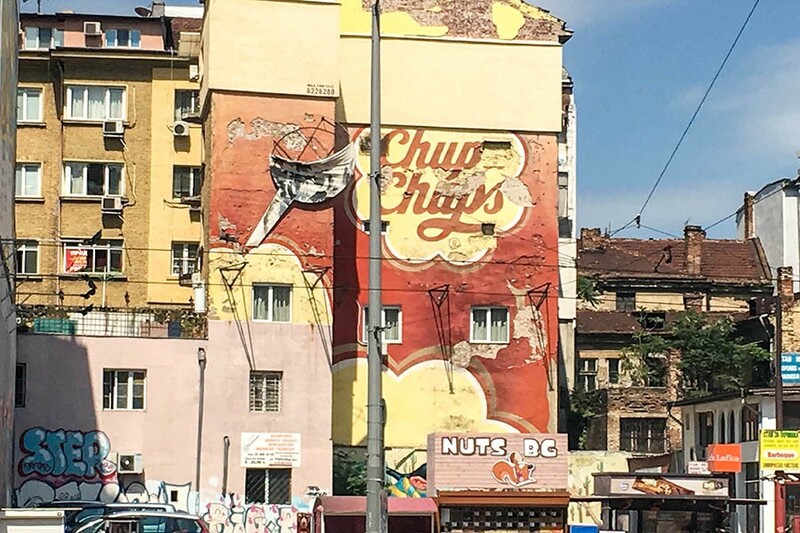 Entering the building is forbidden but there are a few adventurous souls that go inside to see the decomposed murals that once depicted the glory of the Communist party through icons of Lenin and Stalin. Budget: Hostel Old Plovdiv, located in the centre of town, offers free parking, wifi and breakfast. The dorms are charismatically decorated, with single beds instead of bunks. Check out prices by clicking here. Mid-Range: Downtown Plovdiv Family Hotel has well facilitated, clean rooms and spectacular views. There is an on-site restuarant, and it is located in a great part of the city. Click here for rates and to book today. Luxury: Landmark Creek Hotel and Spa has beautiful bedrooms with super clean bathrooms. Enjoy luxury features like free toiletries, white fluffy towels and beautiful wifi or creek views. Check more details and rates by clicking here. Ruse, the Vienna of Bulgaria, is praised for its baroque buildings which are listed in the EU heritage. You can see a bigger presence of its neighbouring country Romania, with a lot of the signs in Romanian. The big plus for us exploring this region was our stay at a B&B in Koshov, a small village, near the mountains and a national park. The B&B, Milkovata Guest House, is a traditional self-sustaining house with its own vegetable garden. It was extremely affordable and the homemade food was better than any restaurant. Click here for rates and to book today. The coast is full of little towns and cities to explore; Varna is the most central. It is a touristy town, with lots of bars and restaurants, but is ideal for day trips and is in a really pretty location. If you have 2 weeks in Bulgaria, you’ll have time to check out some towns further north as well. Balchik is known for its gorgeous botanical garden, the Balchik Palace. Overlooking the sea, the castle and its gardens are beautiful, a must-see stop. Nessebar is extremely touristic due to its ancient ruins and because its a UNESCO location. Budget: Gagarin House is a cosy cheap accommodation option right by the sea. With very helpful owners, it’s a great place to base in and explore the area. Click here for rates and to read more. Mid-Range: Hugo Hotel has comfy bedrooms, air-conditioned rooms with cable channels and wifi. There is a buffet breakfast included. Click here for rates and book today. 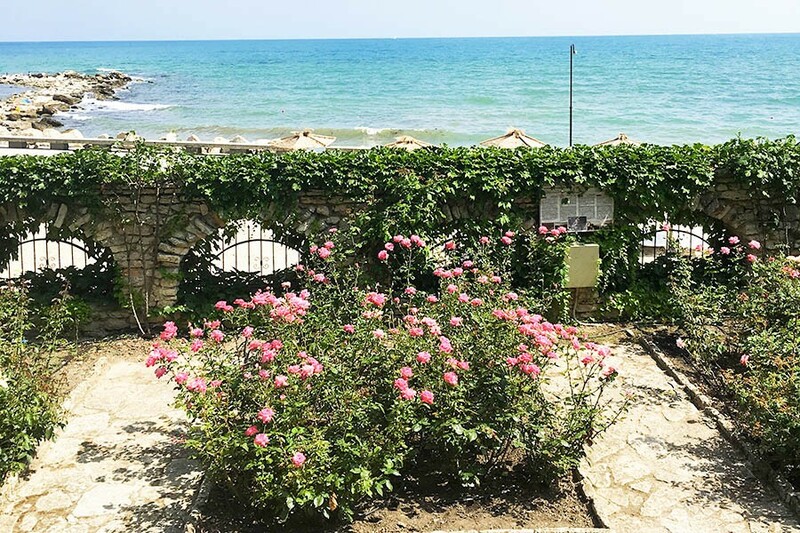 Luxury: Rosslyn Dimyat Hotel Varna is just a 15 minute walk from the beach, with gorgeous, spacious rooms containing all the luxuries you need in such an accommodation and a spa and indoor swimming pool. Click here for rates and to book today. Veliko Tarnovo is often called the city of Tsars, and is a medieval gem of Bulgaria. It actually has a whopping 5,000 years of history just waiting to be tapped into! The city to the Tsvarets Fortress, which is surrounded with 3,000 feet of stone walls and is the top attraction in Veliko Tarnovo. Samovodskata Charshia is a great area for exploring; it was a market street in the late 19th century and has some restored buildings from the time, as well as an ‘old-world’ atmosphere. Also in the town are the Archaeological Museum, detailing Bulgaria’s archaeological history, and the Hadji Nikoli Inn Museum. The Holy 40 Martyrs Church is well worth a visit, as well – it was built in 1230 and has major religious and historical significance in Bulgaria. Budget: Hostel Mostel has been called ‘Eastern Europe’s finest hostel’ and offers guests not only free breakfast, but free dinner and a beer as well! You can choose from private rooms or dorms – or even camp in their garden for a unique kind of stay. It’s a fabulously social hostel where you’ll be making travel friends in no time! Click here for rates and to book today. Mid-Range: Hotel Akvaya is in a great location for those looking for a bit of peace and quiet. On-site there are air conditioned rooms all with cable and a minibar. Guests at the hotel can enjoy a fitness room and sauna. Check here for rates and to book. Luxury: Hotel Studio is situated in the middle of the city’s historical centre. Rooms have cable TV and a minibar and a luxury bathroom. Click here for rates and book today. The currency of Bulgaria is the Bulgarian Lev. 1 Lev = 0.6 USD = 0.45 GBP = 0.81 AUD. Tipping is standard practice – aim for 10%. Bulgaria is typically a very safe country – if you venture to Sunny Beach, stay vigilant for pickpockets. Bulgaria is 2 hours ahead of GMT in the winter and 3 hours ahead in the summer. You’ll need a European style 2 prong plug to travel Bulgaria. You can arrive into Sofia airport from various destinations around Europe, or you can cross the border overland from Turkey, Greece, Macedonia, Serbia or Romania. 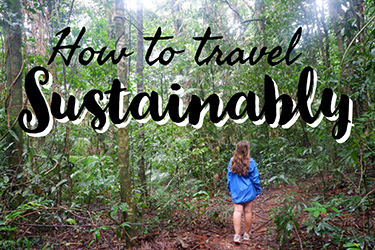 Mel is a part-time traveller and a full-time 9to5er, author of BRB Travel Blog. 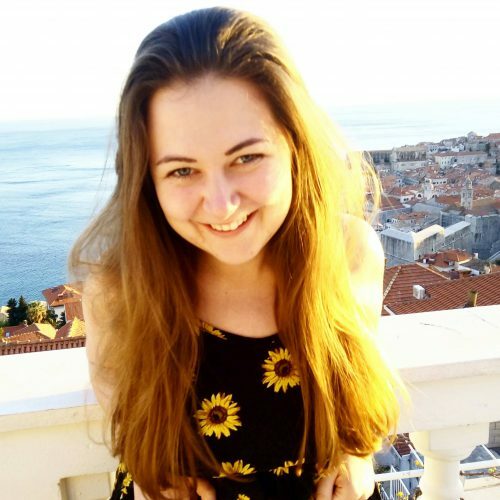 She believes that you don’t need to quit your job to travel the world. Mel took her first trip at the age of 3 and since then she hasn’t stopped travelling. She lived in South and North America as well as in Europe. Born in Venezuela and living in Canada for the past 15 years, she offers a unique perspective of the world. BRB Travel Blog is the cure for her serious wanderlust. 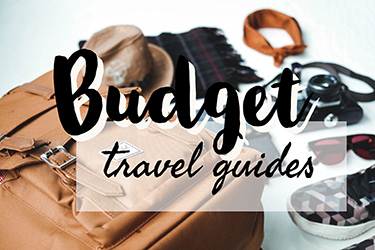 The blog specializes in travel guides, food and drinks recommendations as well as offering extensive coverage of things to do in and around Montreal (Canada). She embraces a destination for its uniqueness and what it offers rather than comparing to other places. BRB Travel Blog likes to cover off the beaten path destinations like Serifos, a small island in the Cyclades, instead of going to Santorini. To keep up with her adventures, follow her blog or like her on Facebook. Like this post? 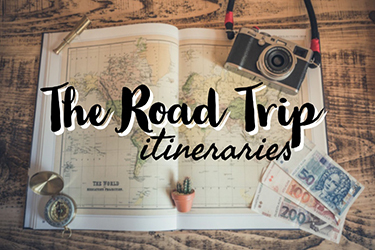 Make sure you share it with anyone else travelling Bulgaria and check out my other overland itineraries – and drop Claire’s Footsteps a like on Facebook as well! Bulgaria is such a beautiful country! If you ever travel the Balkans I recommend visiting Macedonia. Skopje and Ohrid are wonderful cities filled with so much history!